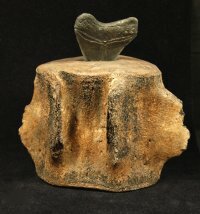 Large Megalodon Tooth in Whale Vertebra Display [MISC180] : Fossils Online, Welcome! Interesting display piece. Paperweight for someone's office? Book end? The tooth has been placed in the vertebra. This was not found like this. 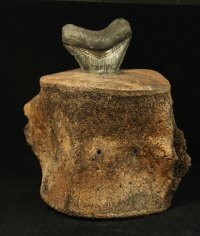 On very rare occasions, the tip of a shark tooth is found imbedded in whale bone. Bite marks are usually left behind, but rarely a tip of a tooth is found. This shows the interaction between the two species in a more artistic fashion. 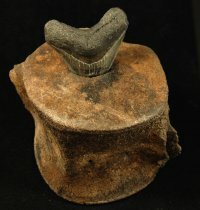 The vertebra measures approximately 5 1/2" tall.